with only a single mobile phone. In 1989, Mark Reynolds founded Just Kampers on his Birthday, September 1st, as he couldn’t get motor traders insurance before he was 22 years old. The business started as a 'one man band' workshop, specialising in the repair of VW Campers, at the Old Pump House in Bagshot, Surrey. The premises were so small that with the doors closed there wasn't enough room for Mark to actually work on a Camper. So the doors were always open which was less than ideal in cold weather and whenever the sky turned grey a tarpaulin had to be draped over the workshop doors to keep the rain off! The Old Pump House didn't have a land-line telephone connection so Mark had to make use of one of the ironically titled ‘Motorola Transportable’ mobile phones – With a battery pack about the same size, and weight as a car battery, it really wasn’t all that transportable! 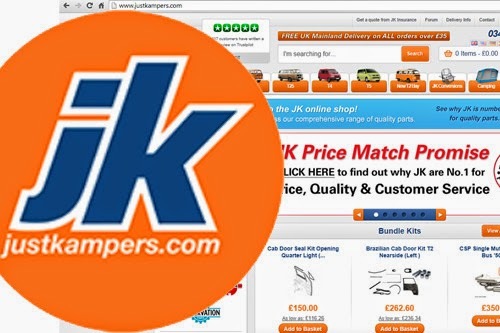 25 Years later, Just Kampers have grown into the UK's premier specialist automotive parts & accessories supplier for VW Campers, Vans, Transporters, & Beetles. T1, T2, T25, T4, T5, & Beetle ranges. Systems Recycling are proud to have been able to assist JK with the removal of their old phone system.